To discover the energy distributing panel by nanotechnology. To know the impact of power industry in the economy of our country business. To know the present status of power related technology in Bangladesh as well as abroad. To know the opportunities of power sector in the world. To credit the future development in this sector. 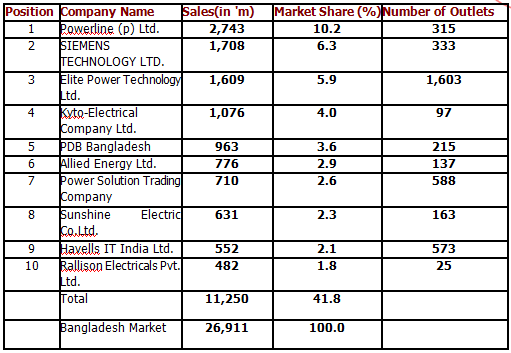 The market of fermented power sector in Bangladesh is very broad. No other company has marketed this product commercially. The scope of the study is limited to the overall project. This project report mainly encompasses technical aspect, marketing aspect, environmental aspect and financial aspect. In the process of the study a number of problems cropped up right from the decision on the topic and down to final writing of this study. The market of GNP is not locally existed so we have to face various problems while collecting information. 1. Lack of the part of experience of the researchers. 2. Unconfirmed accuracy of certain information acquired. 3. Lack of information from the primary source. 4. The comparisons may not be effective enough. 5. Lack of time for preparing the report. The project of our firm Green Neon Power Ltd, a fermented energy firm is extensively involved in the production of power saver and distributing machines. We start our business for the purpose of making a stable position in both home market and foreign market by providing a quality power distributing panel at minimum cost with high quality. This firm is established its main factory in foreign country like China to reduce the manufacturing cost and also location advantage and then supply it in overseas. We also supply it in different types of industries in Bangladesh and China. Anyway, we are going to entry in foreign market by using FDI mode. Green Neon Power Ltd is established to provide quality Power S-distributing Panel at low cost to the customers and gain their ultimate satisfaction. reen Neon Power Ltd. is very new company in Bangladesh. It is a sound idea as it is a period of globalization. In this project we have work for the concept development and feasibility study. If it worked well then we will go for continuous operation. Company Name : Green Neon Power Limited. Offering Name : Power S-distributing Panel. Factory location : Uttara EPZ, Bangladesh. Mode of entry : Foreign Direct Investment(FDI) in China. Business Line : Producing & exporting of Power S-distributing Plant. Number of Partner : Three. Source of capital : Equity 60% and Debt 40%. o our vision is to establishing a stable firm in the energy industry for capturing both the home & the foreign market and also represents our country to the world wide by satisfying the demand of our customers. 1. Higher technology at reasonable cost to our customers. 2. A total power saver solution system that can consume everyone(each industry). 3. Fair, respectful and consistent working relation to our suppliers and channel partners. 4. Significant and responsible growth in sales and profit. 5. A satisfying work environment to our staffs. 1. Upgrade our skills and processes constantly to be the top of the competition. 2. Seek the challenges and acquired the capacity to achieve our dream. 3. Conduct all our activities and transactions with a sense of deep accountability, by being honest within and outside the firm. 4. Respect nature, society and partners as the ultimate good practice of business. he goal of GNP is to be the best energy performer for Power S-distributing Panel in the energy industry. For achieving the goal it work, for the ultimate satisfaction of the customers and provides the high technological energy solution at low cost. reen Neon Power Ltd. is related from manufacturing to solve the power saver and proper distributing problem, so our main objective is to provide our customers the quality product at reasonable price. For this purpose, we will produce different types of Power S-distributing Panel having unique quality. This power plant could remain equal active in both summer as well as winter seasons. We also want to achieve competitive advantage by the uniqueness of our product. This session is presented on the basis of domestic market(Bangladesh) only. Where explained about the micro-environment and macro-environment of GNP Ltd.
An important force in the micro environment of a company is the suppliers i.e. those who supply the inputs raw materials and components to the company. At present GNP Company is developing product quality by using high quality materials. That’s why this company is importing 75% raw materials from abroad and 25% raw materials from the country. The foreign suppliers of this company are Kirloskar Electric Co. Ltd. Rallison Electricals Pvt. Ltd. MEI Limited. AREVA Alstom Limited. Cable Corporation of India Ltd. Havells India Ltd. Biecco Lawrie Ltd.
A company never carries on without customers. Any company may have different categories of customers like individuals, households, industries, and other commercial establishments and government and other institutions. GNP Company never depending on a single customer due to it is often too risky. That’s why this company is decided the target customers both corporate and non-corporate buyers. This company hopes will capture target customers fully. Marketing intermediaries are vital links between the company and the final consumers. And it is also the source of collecting information about product sell, product development, distribution, design etc. GNP Company is carrying on its promoting, selling, and distributing by 5 agencies. The names of these agencies are Ali & Aqbor agency, Trades and Sales agency, MB BANGLADESH TR AGENCY, RAHUL & BICROM AGENCY, and G&J MARKETING LTD. Although it is wrong to think that all publics are threats to business. But it is true to think that a business is continuing to consider all publics .Dutch – Bangla Bank, HSBC Bank, Prime Bank, Prime Finance & Investment Ltd, Rupali Insurance Ltd, are the financial public of this company. The condition of corporate level employees, SBU level employees, production worker and other workers so much good of this company .The condition of the consumers of this company is also good. This company is opened by 3 members who are collected required capital for this business. Although initial capital is managed for starting period but now it is not enough. Due to it is essential to develop the company by establishing new factories with modern technological advancement. GNP Company is approved by Government rules and regulations. The product of this company is also approved by BUEAT. Sometimes company hampered at the importing period only for political reasons. GNP Company is carried on its business to consider socio-culture of this country. Already, this company is done some social cultural activity such as, this company is sponsored on different traditional activities, establish some status in the different place in the Dhaka City. This product is available in three different sector of geographical area of this country .the total area is divided on the basis of corporate and non-corporate buyers. This plant is made by using modern technology that’s why it is matches with weather and climate condition of this country. Port facilities of this country are not better position for rough weather condition. Besides, this company is importing all high quality raw – materials of the product. Due to this country has not any natural resource of the high quality raw materials of this product. International environment is particularly important for industries or business these are directly depending on import or export. It also affect on the price of the product. Due to this company is importing maximum raw materials of the product that reason sometimes increasing international price, the company hampered to earn specific profit. This is a technology based product. That means technology is the main consideration in our business. Anyway, Bangladesh isn’t the best choice for available new technology with skilled persons at reasonable cost. So, this firm must need to be transfer its factory in foreign country. his part of the feasibility study of our business contains the management aspects of the firm. Here a concise description of the promoters, Shareholding of the owners, the legal form of the business, organizational structure, the key resource person of the firm, and the bankers, Consultants and Auditor and The Human Resource Management are discussed. GNP, the energy company is a dream for all its promoters. The promoters of the company are extensively involved with several related areas with this particular business. Among them Mr. Amitab Bhattacharjee has inheritably involved with this business. Other promoters are Md. Jobayer, Md. Azharul Haque. All of the promoters are academically achieved good results and completed their MBA. Some of them are working in different sector of Accounting and Finance. Initially the project setup cost is barred by the promoters themselves at an equal ratio. Green Neon Power Ltd, the fermented energy firm is owned and managed by its owners. Our firm will be a limited partnership, registered under section 56-71 of Partnership Act 1932. Here all promoters will bear liabilities up to their investment. As all of our owners are contributing equal amount of capital, so they will share loss and profit in 1:3 ratio. The partnership of the firm is based on a written. Contract and duly signed by all partners of the firm. According to sections 12 of the Act, our business will be conducted and right and liabilities of the partners will be conducted according to sections 12 and 25 respectively. So by law the firm is operated and managed by article of partnership. Ms. Amitab Bhattacharjee our General Manager is an MBA(Major in Accounting) from University of Dhaka has excellent academic background (CA degree) and is working in a financial institution for 4 years as a senior executive director. Md. Azharul Haque an MBA (Major in Accounting) from NSU and now working in their own business firm as a Senior Accountants. Beside his academic achievement he has sufficient experience in project management. Md. Sarwar Hossain an MBA (Major in Marketing) will be our marketing & distribution manager as he has a great working experience in this field. he is working in the marketing & distribution department of ITS power Ltd.
Mr. Bidhan Saha will be our Technical Manager and Operation as he has more than 32 years of experience in the power industry and has appropriate knowledge to run the production process smoothly. He is also a PhD degree on this field. Green Nano Power Ltd, the fermented energy firm is a Partnership Business and its management and operation process will be directly managed by its promoters. All of the promoters are well qualified and have experience in business fields. Our workers are well trained and skilled and will work under direct supervision of divisional Managers (promoters) in a motivational environment. 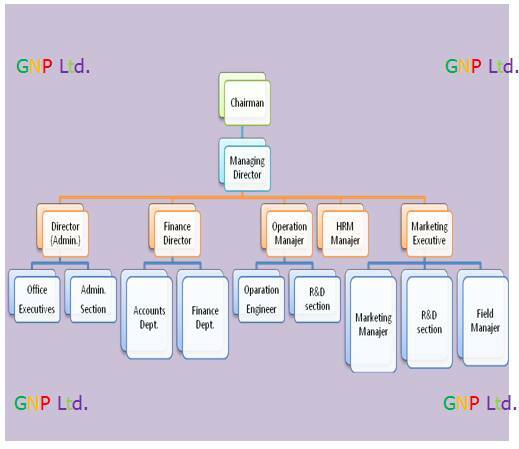 Under the head of organization structure farm’s organ gram is demonstrate and a brief explanation is also given for of the authority and responsibility. The General Manager of the firm is responsible for controlling the overall business, at the same time he must consider the opinion of other owners (working as Managers in different division) in case of policy making and management of the organization. Mr. Amitab Bhattacharjee will be the General Manager. He has completed his MBA and is working in a financial institution for 4 years as a senior executive director. Manager of finance will be responsible for making all the financial decisions & arrange various sources of financing both short term & long term. Again he will be liable to maintain & check Books of Accounts & at the end of the year present the annual sales report in front of the owner. Again it will be his utmost duty to maintain the routine and non-routine transaction occurring in the course of Business. Md. Jobayer who has also completed his MBA (Major in fiancé) will be an effective choice as a Financial Manager from the owners. Manager Technical and Operation will be responsible for controlling the overall production and supply chain management. Under his supervision we expect that, our firm will son achieved high level of production output with an efficient system ensuring an effective supply chain relationship. Engr.Mr. Bidhan Saha will be our Manager Technical and Operation as he has more than 32 years of experience in the energy industry and has appropriate knowledge to run the production process smoothly. Manager Production will be one of the vital posts in our organization structure as he will be responsible to monitor the production process by his direct involvement in the production process. Though he will work under Manager Technical and Operation but he will have the right to suggest any change in the production process. Engr.Mr. Bidhan Saha will be our Manager of Production department. He has got experience in related sectors of our business. Manager marketing & distribution will be responsible for overall marketing aspect of the firm. Under his supervision two divisional managers of distribution & advertisement will work. To find out the best output in the market we served, will be his foremost responsibility. Mr. Azharul Haque will be our manager marketing. He has 6 years experience in the marketing & distribution field & will increase sale. He is now is working in a leasing firm as senior marketing executive. Manager advertisement & promotion will be responsible to evaluate potential market for our products & provide adequate advertisement & promotional campaign to increase our served market. Mollah Nahida Islam will be our manager advertising for her excellent performance in Bitopi AD firm from last 2 years. She is working in the marketing & distribution department of S.B. Power technology Ltd.
Deals with the labor & provide area of their development & also provide the form of incentives which the worker will have for their work. Again the overall human resource planning, employee improvement i.e. overall controlling of HR will be her responsibility. Ms. Tarannum Wahid will be the HR manager as she completed her MBA major in HR & now working in HR department of PADDA TEXTILE LTD.
Mr. Charlie Swan would be our consultant as he has a vast knowledge in this field. He worked as a technical officer in a PA-File production company for 15 years. He will conduct us required consultancy for the accomplishment & regular operation of the firm. He has proper experience in his work field & now working in a reliable consultancy firm. So we think his experience and our knowledge will work together to accomplish our destination. As a Partnership firm, initial capital is supplied by the owner, but we are dealing with such a sector where frequent purchase of raw material is a must. So we do need some long term and short term financing to run our business. We will choose a 60%-40% debt-equity ratio. Here on 60% of the debt will be long term (employed in infrastructure and machinery) and to meet up monthly working capital need short term loan will be taken as form of cash credit. The management of the form has selected three banks for submitting the proposal of business and the feasibility study for their kind perusal. Our firm believes in accuracy and transparency. So we will maintain a well designed auditing system. Under this system auditing activities are dividing into two parts, i.e. Internal and External. Internal Auditing activities will be conducted by the Finance and Accounts division under the supervision of divisional Managers. They will prepare monthly statement and other supplementary statements as required and make necessary correction. External Auditing activity will be conducted once n a year by M/S Rahman Anis & Co. chartered Accountant, address: 62/2 Purana Paltan (5th Floor), Dhaka- 1000. Our firm believe on employee motivation and try to ensure an atmosphere the working area and as well as in the organization where employee and owner can work together. Moreover we try to employee skilled and trained staff and labor to ensure maximum utilization of our capacity. Our Human Resource department is handled by Manager of Human Resource and he tried to accumulate the information from down level of the organization to the top level. And conducted required step to develop a safe and sound workplace along will satisfied worker. In this sector the project analysis of technical aspect is presented. The broad purpose of this segment is to ensure that our project will be technically feasible in the sense that all the inputs required to set up the project are available and to facilitate the most optimal formulation of the project in terms of the technology, size, and location and so on. 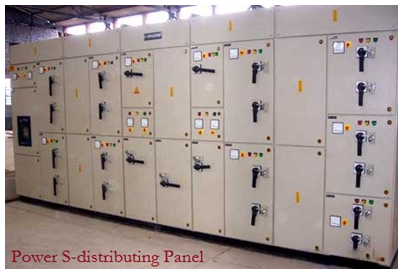 Power S-distributing Panel is different kinds of nanotechnological product. That has an automatic power circuit. By using nanotechnology it can distributing energy with power saving system that are using as directly D C volt. The power capturing and circulation systems have been made by effective three-dimension mode. For that matter this circuit board works through three sides within the same period. Even if any sides of the circuit board have not been able to continue the power circulation than another sides would be covered this problem. The sensor based carbon mono pixel also adds in this circuit board. That’s why the board will be active in every moment. That also help for distributing power properly when need more energy than regular quantity. This plant is more powerful to distribute power with power saving system in twenty –four hours. Flexible movement of panel board. Not harmful for the environment. Not have any risk of electric shock. Any amount of voltage supply. Energy ensured even when loadsheading . This plant will be used for any power related purpose. Any electronic equipment would be carry on by using this plant. Any fractured for manually fittings of the panel. Any servicing within the warranty & guaranty period. Any out connection of electric line. If given any crash on the board. Destroyed by any firing for short-circuit. Destroyed by any natural disasters. For easy communication and wider business connections we will utilize modern facilities such as computers, internet, telephone, fax machine etc. Proper and necessary utilities will be arranged for our project. We will use water, gas and power as utilities. We would use both nanotechnology and neon technology for producing our product. Anyway Buckminsterfullerene C60, also known as the buckyball, is a representative member of the carbon structures known as fullerenes. Members of the fullerene family are a major subject of research falling under the nanotechnology umbrella. Although nanotechnology is a relatively recent development in scientific research, the development of its central concepts happened over a longer period of time. The early 2000s also saw the beginnings of commercial applications of nanotechnology, although these were limited to bulk applications of nano materials, such as the Silver Nano platform for using silver nanoparticles as an antibacterial agent, nanoparticle-based transparent sunscreens, and carbon nanotubes for stain-resistant textiles. Nanotechnology is the engineering of functional systems at the molecular scale. This covers both current work and concepts that are more advanced. In its original sense, nanotechnology refers to the projected ability to construct items from the bottom up, using techniques and tools being developed today to make complete, high performance products. One nanometer (nm) is one billionth, or 10−9, of a meter. By comparison, typical carbon-carbon bond lengths, or the spacing between these atoms in a molecule, are in the range 0.12–0.15 nm, and a DNA double-helix has a diameter around 2 nm. On the other hand, the smallest cellular life-forms, the bacteria of the genus Mycoplasma, are around 200 nm in length. The upper limit is more or less arbitrary but is around the size that phenomena not observed in larger structures start to become apparent and can be made use of in the nano device. These new phenomena make nanotechnology distinct from devices which are merely miniaturised versions of an equivalent macroscopic device; such devices are on a larger scale and come under the description of microtechnology. 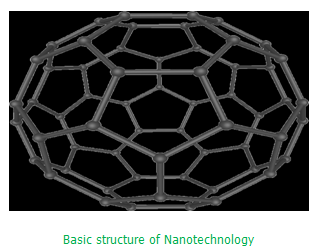 Two main approaches are used in nanotechnology. In the “bottom-up” approach, materials and devices are built from molecular components which assemble themselves chemically by principles of molecular recognition. In the “top-down” approach, nano-objects are constructed from larger entities without atomic-level control. Industry analysis is a tool that facilitates a company’s understanding of its position relative to other companies that produce similar products or services. Understanding the forces at work in the overall industry is an important component of effective strategic planning. Industry analysis enables small business owners to identify the threats and opportunities facing their businesses, and to focus their resources on developing unique capabilities that could lead to a competitive advantage. Ease of entry refers to how easy or difficult it is for a new firm to begin competing in the industry. The ease of entry into an industry is important because it determines the likelihood that a company will face new competitors. In industries that are easy to enter, sources of competitive advantage tend to wane quickly. On the other hand, in industries that are difficult to enter, sources of competitive advantage last longer, and firms also tend to benefit from having a constant set of competitors. For globalization, market is too much broad now. That’s why GNP Ltd. wants to enter this market with high financial support and quite new technology. So that they can sustain and grasp the market. Suppliers can gain bargaining power within an industry through a number of different situations. Supplier power can affect the relationship between a small business and its customers by influencing the quality and price of the final product. “All of these factors combined will affect our ability to compete,” Cook noted. “They will impact our ability to use our supplier relationship to establish competitive advantages with our customers.” For that reason this firm(GNP Ltd.) is decided to established its main production house and research center in foreign country. So that this firm can maintain a good relation with its suppliers as well as to reduce the production cost. The reverse situation occurs when bargaining power rests in the hands of buyers. Powerful buyers can exert pressure on small businesses by demanding lower prices, higher quality, or additional services, or by playing competitors off one another. The power of buyers tends to increase when single customers account for large volumes of the business’s product, when a substitutes are available for the product, when the costs associated with switching suppliers are low, and when buyers possess the resources to move backward in the chain of distribution. Actually, GNP Ltd. Is the first mover for that kind of product in the present market. Besides, a need is created among the customer (specially industrial sector) for this type of product, some days ago and that is increasing day by day in the world. “All firms in an industry are competing, in a broad sense, with industries producing substitute products. Substitutes limit the potential returns of an industry by placing a ceiling on the prices firms in the industry can profitably charge,” Porter explained. Product substitution occurs when a small business’s customer comes to believe that a similar product can perform the same function at a better price. The main defense available against substitution is product differentiation. By forming a deep understanding of the customer, some companies are able to create demand specifically for their products. But in case of Power S-distributing Panel, it is too difficult to create its substitute easily. “The battle we wage against competitors is one of the strongest industry forces with which we contend,” according to Cook. Competitive battles can take the form of price wars, advertising campaigns, new product introductions, or expanded service offerings—all of which can reduce the profitability of firms within an industry. Anyway, now given competitive analysis on the below on the basis of Bangladeshi market of that industry. or a local or regional business assessing the competition often is best completed initially by the client under our direction with our review, comments, and edits. We specialize in research that can establish the competition either locally, regionally, or nationally, depending on the goals and objectives of a particular energy product business plan. Once we have established the Service Area and then completed the Competitive Analysis and Market Share, we can then establish a Market Penetration Rate. The Market Penetration Rate is defined as a series of logical assumptions that determines what percentage of customers or consumers will utilize our business service(s) and/or business product(s) within our service area over a period of time and is closely aligned to our business plan. ii. Elite Power Technology Ltd.
All of these companies are existing company. The main strength of these companies is they have already captured their market share. Beside they have produced lot of products. Also they have introduced lot of power system. Like PA-File, Photovoltaic Systems, Solar Panel Mounting Systems etc. Though all of these are existing companies, they have some weakness. Their plant installation cost is very high in the basis of our company. Besides, these firms are used existing plant technology. Their panel is not portable and also fixed size. But our product is portable and reassemble size. iii. Sunshine Electric Company Ltd. This step is appropriated only for domestic market (Bangladesh). Now shows two graphical presentations to present our market share. Investors look at market share increases and decreases carefully because they can be a sign of the relative competitiveness of the company’s products or services. As the total market for a product or service grows, a company that is maintaining its market share is growing revenues at the same rate as the total market. here has been a growing interest among the academia and the private sector for the use of GIS (Geographic Information Systems) techniques in the analysis and planning of retail store network. Over the past few decades the methodologies used for research of sighting of retail outlets have become more sophisticated as a result of applicable modeling procedures being developed with GIS. This study conducts a retail location analysis of the relationship between the company offerings and customer behavior and socio-economic factors of their respective catchments areas(trade area). The socio-economic profiles in the partitioned polygons have been analyzed with a series of regression models. The result of the study has brought out a better understanding of how location factors influence the performance of the stores as well as how the socio-economic attributes of the catchments areas affect the store revenues. To consider these factors GNP Ltd. has selected a dynamic location at Dhaka city in Bangladesh. Now the trading point is shown through a layout. The ideal location for such project must be inside of the Dhaka city and the place must be located within closer proximity of the airport to reduce the transportation cost and other costs such as taxes. Again it has to be well connected with highway road communication. Considering all this factors we have chosen a suitable place for the proposed Green Neon Power firm at Bashundhara in Dhaka. Marketing strategy is a process that can allow an organization to concentrate its limited resources on the greatest opportunities to increase sales and achieve a sustainable competitive advantage. A marketing strategy should be centered on the key concept that customer satisfaction is the main goal. 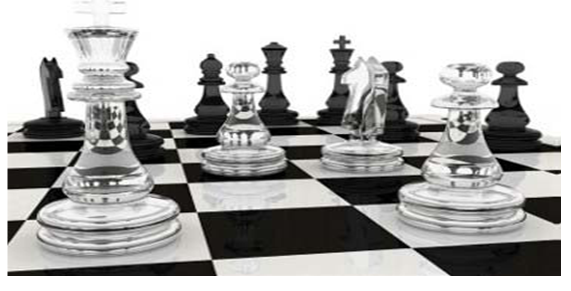 SWOT analysis is very essential elements for any organization. In any company’s project analysis, the most important part is the SWOT analysis. The SWOT analysis consists of two parts. Internal analysis refers to the internal situations that are prevailing and their impacts. They usually come along with the strengths & weaknesses. If it is within the company then they will fall under these two categories. External analysis on the other hand refers to the environments that are relevant to the business directly or indirectly. They come under opportunities & threats. It is a unique product. Unique technology with high performance. It is easy to outsource. Power S-distributing Panel does not create any pollution. System will operate with negligible maintains. Initial capital cost of installing a Power S-distributing Panel has been invested, maintenance costs are low compared to existing technologies plant. Power S-distributing Panel isn’t needed a lot of space for installation. Huge amount of capital needed which is one kinds of our weakness. The main weakness of our business is that we are a start-up business and that we have to face already established retailers. We are selling the product that consumer are not well aware. It requires heavy advertising and promotional activities. 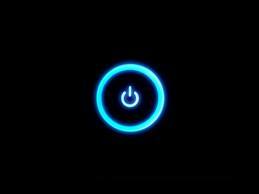 Power problem is a major problem in Bangladesh and foreign country. The rising utility prices give us a good opportunity to set ourselves in the market. Pixel cells produce DC power which must be converted to AC power by using a grid sensor when used in distribution grids. This may incurs an energy loss of 4-8%. Discovering new technology that more flexible in power industry. Changing of Govt. laws in this industry. Our mission is making the product available in the market with a very competitive price so that customer can get complete satisfaction by consuming the product. We also want to establish our new brand of GNP Power S-distributing Panel. At first we want to spread the product through the whole country and reach each and every consumer then we would go to export our product all over the world. The marketing objectives of the company for the product are as follows. Maintain a gross margin of 25% first year. Generate an average of Tk.20000000 of sales each business accounting year. Realize an annual growth rate of approximately 30% within the year 2015. Non-corporate Buyers: In case of Non-corporate buyers, we are mainly focusing on the individual or household, and Developers (apartments). In the power sector consumers, who are tired or looking for a proper power distributing plant with power saving system, “Power S-distributing Panel” is offering them the highest satisfaction in a reasonable cost. “Power S-distributing Panel” is offering the consumer a clear assumption from the other power source product. Consumer can also experience the difference. That’s why we always say “Turn on your switch” to our customer as well as consumer. The greatest objective is to establish our new brand in the industry. The marketing strategy will seek to first create customer awareness regarding the product and establishing connections with targeted markets and work toward building customer loyalty and referrals.  Increase awareness and image.  Quality and power leadership. Informing the consumers about our new product “Power S-distributing Panel”. Through, advertisement, leaflets, News papers, Television, events we can increase awareness of the product and establish image of our product. Another strategy is for being the quality and power leader in the market. We will offer the best quality power source product in the market which will make us quality and power leader in the market. We will also going for mass distribution of our product. We want to distribute our product each and every corner of the domestic as well as foreign markets. For doing that we will engage more dealers in every corner of the domestic as well as foreign markets to make our product available to all the customers within 2016. The Company established the price of its new product “Power S-distributing Panel” with the concept from cost based pricing. According to our calculation the cost of our product is Tk.7108.85 and we set Tk.8950.00 only for each units(each per KB of the Plant). We will primarily use our new dealers for distributing our new product “Power S-distributing Panel”. Then, we will make some new channels and assign some dealers to promote our new product to all over the world. The most successful advertising will be through international TV channels(International), which are the most popular television channels in the world. We will also use Internet or online advertising and some bill-boards and leaflets to promote the product. Our product will enable our customers to have a different experience in power source. They will be able to differentiate our product in quality which is unique in the power market. We should set the price of our product based on the competitor price. After analyzing our production cost, marketing advertisement, promotion, and distribution we have come to a decision that our setting price for the product will cover our total cost and will bring profit within next few years. Finally, considering all the factors associated with our product manufacturing we are going to set the price for Tk.8950.00 only. To initiate strong awareness about Power S-distributing Panel. To win market shares over our top functional energy related competitor. Only media that can reach 90% of the homes in Bangladesh and also some in the Middle East. We have the budget to cover the high costs. About 30 consumer magazine in Bangladesh and other magazines of Middle East. Each magazine’s readers often represent a unique profile. Official promotional website: www.gnppower.com, visual audio and video, message, banners on selected websites. Newspaper Advertisement: The Prothom-Alo, The anokantho, The Jugantor, Daily Star, The Independent etc. Leaflets – Would be distributed about the product in different areas. Green Neon Power Limited is going to start its corporate operations by manufacturing Power S-distributing Panel in home and abroad respectively. This firm wants to provide standard quality product with proper time & price. However, this firm is decided, FDI way as a mode of entry. Now showed the reasons for choosing FDI mode. Transaction cost is also a reason. After considering above factors, this company (GNP Ltd.) is going to FDI. Evaluating market potential : In that stage, this firm is considered only foreign market(China). This firm will go in China market with new technology. For that reason, market potential will be low. Evaluating levels of competition : “Power S-distributing Panel” is a totally new technological product in the energy industry in the world. That means GNP Ltd is the first mover company for this product. So, this firm may face low competition and also get more advantage in his field. Evaluating legal and political environment : the legal and political environment of China is quite different. That means this country is perfect place for that kind of business. Besides, this country is not allowed unfair practice of politics. Evaluating social-cultural influences : The socio-cultural of China is very favorable for technological business. Assessing or evaluating costs, benefits and risks :The next step in foreign market assessment is a careful evaluation of the costs, benefits and risks associated with doing business in foreign market. Costs : There are two types of costs. One is called Direct cost and another one is called Opportunity cost. Actually, the direct cost is not so high to do this business in this country(China). Expected sales may high from this market(China). The fluctuation of exchange rate is a common risk, now-a-days. Besides, changing existing rules and regulation may occur barrier in this sector. Selecting the mode of entry : In this step, GNP Ltd is selected Foreign Direct Investment(FDI) as a mode of entry. This session is appropriated for only CHINA (foreign country). GNP Company is approved by Government rules and regulations. The product of this company is also approved by China Govt. Besides, the political environment is quite well in China. GNP Company is carried on its business to consider socio-culture of this country. Already, this company is done some social cultural activity such as, this company is sponsored on different traditional activities, establish some status in the different place in the Dhaka City as well as CHINA. This is a technology based product. That means technology is the main consideration in our business. Anyway, China is the best choice for available new technology with skilled persons at reasonable cost. Business ethics is a form of the art of applied ethics that examines ethical principles and moral or ethical problems that can arise in a business environment. In the increasingly conscience-focused marketplaces of the 21st century, the demand for more ethical business processes and actions is increasing. For that’s why our firm are very concern about ethical issue. Our project maintains all laws and social consideration. An approach for SR that is becoming more widely accepted is community-based development projects. A more common approach of SR is through the giving of aid to local organizations and impoverished communities in developing countries. We have some approaches. These are Early Learning Centre to help educate the community’s children, education facilities for adults, as well as HIV/AIDS education program. Taking responsibility for its impact on society means in the first instance that a company accounts for its actions. Social accounting, a concept describing the communication of social and environmental effects of a company’s economic actions to particular interest groups within society and to society at large, is thus an important element of SR.
Our project is very concern about the impact on society of the action of this project. We have a regulatory committee which gives periodic report of social impact. The scale and nature of the benefits of SR for an organization can vary depending on the nature of the enterprise. However, businesses may not be looking at short-run financial returns when developing their SR strategy. Our project works out of our long run benefit and often include charitable efforts and volunteering. Our CSR based within the human resources, business development or public relations departments of an organization. orporations exist to provide products and/or services that produce profits for their shareholders. Only people can have social responsibilities, corporations are only responsible to their shareholders and not to society as a whole. Although we accept that corporations should obey the laws of the countries within which they work and hold that the economy exists to serve human beings, so all economic entities have an obligation to society. Moreover our SR proponents point out that SR can significantly improve long-term corporate profitability because it reduces risks and inefficiencies while offering a host of potential benefits such as enhanced brand reputation and employee engagement. Green Neon Power Ltd. is going to start with a belief that “A man’s feet must be planted in his country but his eye should survey the world.” Since itsinception, Green Neon Power Ltd has been driven to be inspiring and leading byexample, when it comes to being involved in the community. Green Neon Power, this Firm believes that, sustainable development can only be achieved through longterm economic growth. In conclusion we ask exoneration for any unwantedmistakes in our feasibility study and ask for kind consideration to consider ourintense effort in this project preparation phase.